Daniela Jaeger ’13: “During times when I feel like circumstances are out of my control, I employ methods of self-help. This involves planning a clear and reasonable plan of attack on my assignments and dividing up the next few days into blocks of time, noting which blocks will be devoted to which assignments or classes. Writing down this type of plan helps me realize that my study goals are more reasonable than I first imagined, and this reduces stress. “Exercising and practicing music also helps to clear my mind, which leads me to be able think more clearly. If this doesn’t work, I seek the advice of friends. I often find that panic and feelings of stress exaggerate my perception of the situation, and simply voicing my worries to someone often helps to lessen the psychological burden. “I adhere to a routine that entails running around the neighborhoods surrounding the College three or four times a week. I started this in my sophomore year, as I found it noticeably reduced stress. Frequent breaks like these are therapeutic and essential to maintaining a sense of balance. 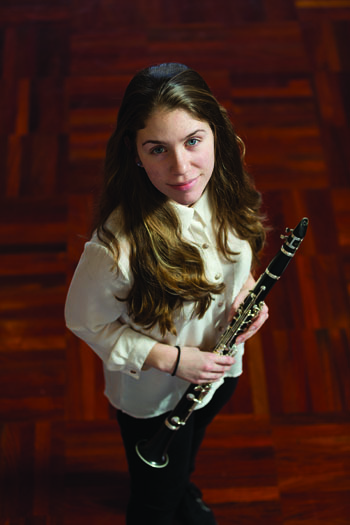 “I also attend wind ensemble rehearsals once a week and practice music on my own during the week. These breaks are particularly rewarding, because I’m forced to concentrate on nothing but music. After practicing or rehearsing, I’m much more relaxed and content. “I often attend on-campus concerts and dances, mainly because I fill my weekdays with studying and relax on Friday and/or Saturday evenings. I feel renewed after forgetting my assignments for an evening and can focus more easily for the next few days. Dina Zingaro ’13 (From Speak2Swattie’s Insider Stories: “I Work Out”): “After my freshman year of college, I decided not to continue playing on the College tennis team. I found myself as a sophomore with my head perpetually in the books in McCabe. Instead of going to practice from 4 to 6 p.m. or hitting the treadmill in the morning for conditioning, I no longer found myself frequenting the Fitness Center. My mind rarely enjoyed a break from schoolwork. It took me a few weeks to fully realize that what I really needed was time away from the books. But at Swat, as most will probably agree, taking a break from your work often induces guilt. “Mental health has been shown to be strongly correlated with physical activity … and without the physical activity I’d been accustomed to as a Swat athlete, my mental health suffered: I was stressed out, high strung, and overly anxious about deadlines and assignments. Of course, these woes existed even when I was exercising, but without it, everything was intensified because I had no release. So, forget ranting to your friends or playing Misery Poker: the gym offers a cathartic release from the stress of Swat [academic] life. The gym is a refuge. Bring your anxiety, your anger, or any stress in the books. The gym never judges. “The gym can also be a great place to challenge yourself. As little Swattie nerds, we generate motivation by lusting after the best paper, the better test result, the better analysis. However, whether it’s just a few more crunches or five minutes more on the treadmill, the gym offers opportunities to test ourselves physically—something I’ve found to be extremely empowering. Stephen Dini ’13: “The combination of exam periods coupled with papers and research projects and trying to meet the deadlines that come with them are what cause me most stress at Swarthmore. “I’m not a member of any athletics team, but I do play intramural soccer in the fall. Also activities such as going to the gym at least three times a week and for a long jog once a week provide me with an avenue to refresh myself as well as tone down any stress that I might have been experiencing during the week. I always find myself feeling better afterwards. “I also attend on-campus concerts and dance parties. The dance parties are especially relaxing, because prior to the actual party, you get to meet with friends and hang out before going to the actual party. Meeting with friends and learning how their week went as well as talking about your own week provides a measure of stress relief. “Having friends is very important. When I’m stressed or worried about something but have somebody to confide in, I usually feel less stressed about whatever is causing the stress. 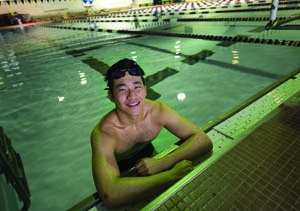 Tony Lee ’15: "The most stressful times at Swarthmore are when you hit a bottleneck—those one or two weeks when the work from four of five courses culminates, and you have athletics commitments and those from all the student groups you’re in. “Sitting in Sharples, it’s easy to notice from conversations when peers are having a tough time—usually before midterms or finals. The usual solution is to sacrifice physical activity to give academic work first priority, which then becomes a vicious cycle of stress, because studies show that physical activity reduces stress and increases work productivity. I’m committed to the varsity swim team through the fall and early spring, and I also play club ice-hockey twice a week on a drop-in basis at a rink about five minutes by car from campus. As a member of the swim team, I have a voracious appetite. Dining Services does a really good job of feeding us well. I also maintain energy—both mental and physical— by making sure to get six or seven hours of sleep a night. “Last summer, I started practicing hot yoga—in a temperature-controlled room at typically around 104°F. Sessions last for about 90 minutes, during which participants move through a series of 90-second-long asanas (poses). It’s like a purging not only of the toxins that build up in the body but of stress, too. “The result of a survey during the Student Activities Fair during Orientation last fall resulted in 150 students signing up to try it out, but there were no viable venues to practice it on campus. Funding from the Student Budget Committee and from the Wellness Program through Satya Nelms enabled some friends and me, operating under the charter of the Ashtanga Yoga Club to offer an off-campus hot yoga program using a studio in Media. Thanks to College’s genersosity, students are able to obtain transportation to Media and attend four sessions at no cost. Setting a cap at 25 students a session, we’ve accommodated all those who signed up. “Relaxing with friends at concerts in Philadelphia once or twice a semester also takes me out of the academic setting for a while. For one night, I don’t have to worry about upcoming deadlines. "A close network of friends both in and outside of my major are all-important. Study groups work against stress, as opposed to being cooped up in your room alone. Friends and faculty members have always been understanding if I’ve felt overwhelmed. Marina Tucktuck ’13: “I stress mainly about academics. Another challenge for me is being away from home. I haven’t seen my family in a year and a half, so I’m very homesick. The last time I saw them was in the winter of my sophomore year, and it was two years before that that I came to the George School for high school. “After graduation, I’d like to go home, take a gap year, then do a master’s in public health before applying to medical school, or maybe work for a year as a TA somewhere. I need to do something more relaxing. “As a Richard Rubin Scholar here, I was matched up with a mentor on campus, Jocelyne Noveral, a lab instructor in the biology department. She’s amazing. I’m constantly in touch with her, and she’s been a great support for me here. She always notices when I don’t look well. Then, she just takes me somewhere and we talk. Talking with her has made things so much better. She’s a really nice mother figure and mentor and really encouraging. “I’m also close with Jennifer Gold, the international student adviser on campus. I talk to her a lot. She has also been very supportive. I also talk with international friends who seem to have much in common with me. We go through similar challenges in terms of being in different country, the academics, being away from home. They can comfort me more than any other peers on campus. “Talking is the best de-stressor for me, so that’s what I try to do most. Sometimes, I walk on the campus or down to the Ville, just to clear my mind. The campus is so beautiful. Or I walk to the Crum, trying not to think of anything else, just being relaxed. “I’m also an EMT with the Swarthmore Fire Company, which I really enjoy. Taking the role of a health-care provider takes my thoughts away from myself and focuses them on someone in need of help. “My family also helps me. Every Saturday, I SKYPE with them for about two hours and get all their news. 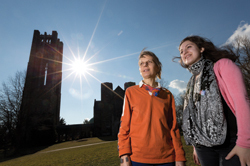 “I love Swarthmore, and I’ve learned so much, and I wouldn’t have been the same person if I’d gone somewhere else. Stephanie Carrera Lozano ’15: “I think of wellness as a general ‘activity’ that I do for my own sake, not one that can be graded. Owning my wellness is centering because it’s a part of my life that doesn’t depend on someone else’s opinion or a grade to denote its value. It’s 100 percent mine. “The number one piece of advice I can give is to make a feasible schedule of what you want to do. Make sure to sign up for it and tell a lot of people you’re doing it. I fell off the wagon a bit one semester, skipping Sharples and reading an hour of reading, but I literally had so much I couldn’t skip. “I was happiest at the beginning of fall 2012, when I’d wake up at 5–6 a.m., eat breakfast when Sharples opened and take the path through the woods to get to the Science Center (a walk of about 30 to 45 minutes, depending on which entrance I chose and how much I dawdled looking at all the pretty birds and bees. At the Science Center, I’d buy something to drink and head to Cornell Library to read scholarly journals for an hour before heading to my first classes, which started at 10 or 10:30 a.m.
"I can’t stress enough how peaceful that morning environment is, especially in the woods, where I’m helpless to do anything but interact with nature and it’s pointless to worry about anything because I’m in a location where I can’t do a thing about it anyway. I’m committed to enjoying the moment for however long it takes me to get through the woods. I’ll deal with everything else when I get out. It’s nice. “In the afternoons, I took Jocelyne Noveral’s phenomenal aerobics class as well as volleyball for the first and Pilates for the second quarters. All those classes are excellent. “Food is also really important. I love veggies and always eat at least two whole plates of just veggies for dinner (aerobics leaves me quite voracious). To a small extent I color-coordinate my food—I can’t stand seeing it look like varying shades of brown—so I add the veggies to make my eyes happier, and I end up happy after eating such a nice meal. I have to like what I’m eating, and it has to make me feel good. “The end of the day is a really awesome decompression period. I talk a lot with my roommate if we’re both up before bedtime. It helps me digest the day, and I really like bonding with her. Travis Mattingly ’13: “I believe everyone at Swarthmnore—students, staff, and faculty— feels stress, because we’re all trying to expand ourselves, which is really good, but it’s sometimes difficult to find balance in the things we do. “As a chemistry major, sometimes the math and physical chemistry is hard for me. So I get really stressed by the labs. “When life becomes super-stressful, and I have to stay up really late, I make myself sit back and take a few deep breaths—something I learned from yoga—which puts things in perspective and helps me cope. “I’ve been teaching yoga on campus for the past four years. Kelly Wilcox, a former assistant dean of student life, helped me and two other instructors who had also just been certified, like me, and we started offering classes. I got an email list going, and the class has really grown from very few in the beginning to 15 to 20 participants currently. We have faculty, staff, and students attend the classes, which take place on Tuesday evenings. 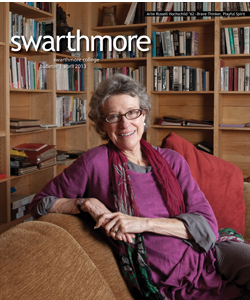 “I also try to eat well, and Swarthmore makes that really easy. My eating habits have improved since I’ve been here, because of the availability of the salad bar. I work with The Good Food Project and managed the garden through the summer. It’s important to know where all this good food comes from. Everybody eats, and I believe that that’s one of the most direct ways we can impact the world. “I'm also a member of the run cross-country and track-and-field teams, which helps against stress, and the coaches are understanding if we need to miss a practice because of academic obligations. I also run calls with the local fire department, something I began doing in high school. “I also have special spots on campus that are calming for me. During Snowmaggedon, when I was trudging up to class at 8 a.m., I asked myself, ‘What am I doing?’ But then, I think of the President’ Lawn and all the cherry trees—just gorgeous. That connection with Nature is important. I always try to walk to class through the amphitheater. Yin Guan ’13: “I came in not realizing how much work taking four classes would be. This is something I still struggle with. In high school, you take seven or eight classes, and it’s still manageable. So sometimes, what’s stressful for me is just the amount of work that piles up, and that aggregates in my mind, then I get stressed and don’t know where to start. All the deadlines overlap, and I think there’s this culture at Swarthmore that you’re expected to keep yourself busy all the time, and if you’re not, you’re doing something wrong. It’s a student-created culture. “Then you have a lot of extracurricular activities that are sometimes just as much work as class work. Since my freshman year, I’ve been part of a community-service organization called Community Conversations. In the past two years, we’ve focused on developing college access programming for immigrant Chinese youth in Philadelphia. That’s something I’m committed to, but just trying to condone that commitment and that relationship between yourself and an organization in Philly, and actually going there is a huge time commitment. But being down there and around other people really helps me a lot. “One of the first things I did when I came to Swarthmore was to become involved with the Swarthmore Asian Organization (SAO). A part of me was missing the connection I felt to that community back home, which is really an immigrant Chinese community. Through the SAO, I work with people from Philadelphia’s Chinatown, and being involved in something outside Swarthmore that is in some ways connected to my own experiences makes me feel more grounded. I’m really engaged with it and enjoy it a lot. “I’ve been involved with a variety of student groups on campus—the Forum for Free Speech Committee, Green Advisers, Catalyst (an annual science conference for middle school girls), Independent Thought and Social Action International (working with high school students from India to cultivate independent thinking and awareness of social justice issues. I’ve been a camous ambassador for Teach for China, and I have a work-study position in Cornell Library and one in the Off-Campus Study Office. I’ve worked the Phonathon, in Paces Café, and been an admissions counselor for prospective students. I also tutor students in Mandarin Chinese and organic chemistry. I enjoy all of these. “My friends are of the utmost importance. I’m so fortunate that I’ve been able to develop close friendships with people I’m able to have really meaningful conversations with. My support network is really those people. “One of the things I enjoy most is talking walks at night with a friend. Just walking and talking is one of my favorite things. You don’t get to see the beautiful campus, but you do get to see the stars. Taking a walk before going to sleep is a nice way to end the day. 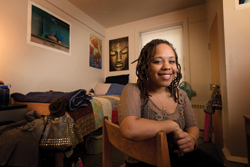 Alaina Brown ’13: “To avoid being too stressed, I try to stay around people who are positive and supportive. I spend a lot of time at the Black Cultural Center, where I’m an RA and where we all encourage each other. A lot of the time at Swarthmore, I think we all create our own misery poker game, and although anyone can play, we should at some point stop and convince ourselves that it’s not that bad and we can handle it. “Also, since I was a first-year, I’ve been known for having a very tranquil room. I have a little Zen corner and lots of color. I brought in a purple rug, some little pillows from Thailand, and some purple drapes that hung from the ceiling. When people wanted to take a break from homework, they came and hung out there. Having been a student listener in boarding school, I was used to having an open door and making my space relaxing for other people—and myself. “Rather than denying the existence of stress, students should acknowledge it and learn to be OK with it—and take the time to breathe. “I also write poetry and started a club called Oasis with another student, where we get together once a week and perform. It’s a good way to release whatever thoughts you have onto paper and channel your energy into the performance. You feel nervous, but it’s a good different kind of stress from the academic kind. “Getting off campus is regenerative, so I try to go either to Philly or New York on every second weekend of the semester. Bryn Mawr and Haverford offer free passes to their students to take the train to Philly. I wish that Swarthmore could do something like that. “Taking time for friends and developing organic relationships with people who support each other."